INSTANT COOLING - Woven by 100% soft cool bamboo fiber, with its mesh structure, can evaporate faster than others. Due to excellent evaporation, it is anti-bacterial and anti- mite. It is easy to activate the cooling towel by soaking, wringing out and snapping it for 3-5 times. When water evaporates, it cools. It stays chilled at least 3 hours and ensure body temperature below 30 degrees. EXTRA LONG, AMAZING SOFT, BEST CHOICE FOR SKIN CARE - Eight colors make you free to choose. M:40" x 12'' especially recommended in women and children.L:47" x 14'' Perfect for men, more than 5'7'' height. It's enough long to cover your shoulders and arms at the same time. It is silky soft despite dry or wet unlike chemical material that dry stiff as cardboard. The soaked fabric is pleasant to touch, rather than awfully dripping wet. So it is really your best choice for skin care. MULTIPURPOSE - When you move around, tie it on your neck and it plays like chilled scarf. It is anti-UV like a charm as UPF 50 sunscreen. It is tailor-made for athletes, sports fans, body builders in gym, workers at high temperature and pets. It's also a physical remedy for fever-patients, whom suffering with hot-flashes, patients needing cold therapy after operations. All of our products have passed RoHS to ensure it dose no harm to your health. If there is any problem after your purchase, please let us know, we will be more than happy to help you. What are you waiting for? Catch the chance to bring it back! 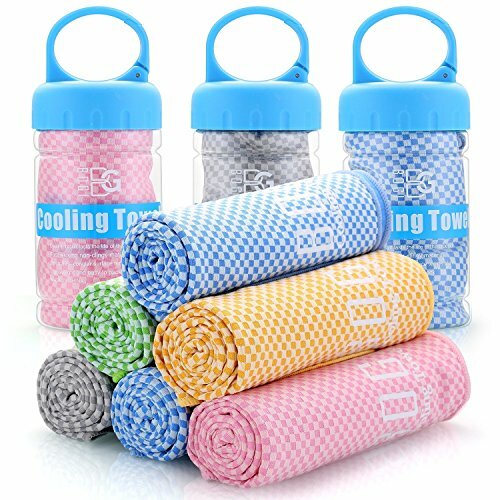 SPECIAL PACKAGE, ECO-FRIENDLY CARRYING BOTTLE WITH CLIP -With the plastic bottle, it is easy to carry the cooling towel on a marathon, hiking, rock climbing and the so on. The recyclable bottle is more durable than a pouch and more accord with ecological notion. A built-in clip is fixed on the top of the bottle, so you don't worry about losing the clip and you can attach it to your bag belt.Besides, the fashionable color scheme makes you look cool and it is a great gift for whichever age. HEALTHY MATERIAL: The towel is woven by 100% soft cool bamboo fiber without special odor and durable, superior to chemical material. DURABLE ROUNDED EDGE: The rounded edges are exquisite stitching is not only aim at a good looking but also used for preventing from unraveling. SOFTER: It is silky soft despite dry or wet unlike chemical material that dry stiff as cardboard. The soaked fabric is pleasant to touch, rather than awfully dripping wet. So it is really your best choice for skin care. ECO-FRIENDLY CARRYING BOTTLE: The recyclable bottle is more durable than a pouch and more accord with ecological notion. BUILT-IN CLIP: The clip is fixed on the top of the bottle, so you don't worry about losing the clip and you can attach it to your bag belt. Package size(inflatable): 2.6" x 2.6" x 5"